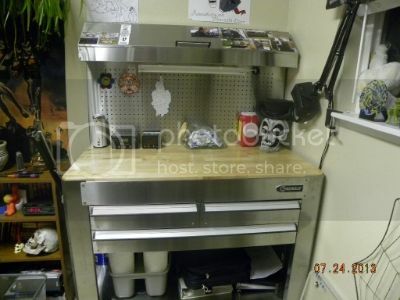 Home Forums Cleanliness is next to Godliness Where to Buy the Tattoo Safe Gear? New work station. This topic contains 13 replies, has 0 voices, and was last updated by Jester 5 years ago. Didn’t know where else to post this. there, and a manager/friend hooked me up for $65.00. Very nice station. So jealous. Thanks for posting. Looks very professional. Right now I’m build dividers for the drawers to orginize my supplys. I just finished the deviders, and I’m waiting for the paint to dry. because it can’t be steralized. For now, I just plan to cover it. Well you can’t STERILIZE wood or glass, just like a human skin. I think you mean SANITIZE. Looks like a nice setup..
Also lets you established your entire fireside. Wow that’s nice is it all one piece? Yeah, it’s all one piece. I’ll have to post some pics with the deviders in the drawers. A measures participates a derived-Together country Gielinor that is.